Summer is still in full swing over here, how bout for you? Ice cream is eaten year round at our house, but it does have a special spot for summer. It's a tasty way to cool off in the heat. And since we've been experiencing high 90s temps, I'm always ready for some ice cream. 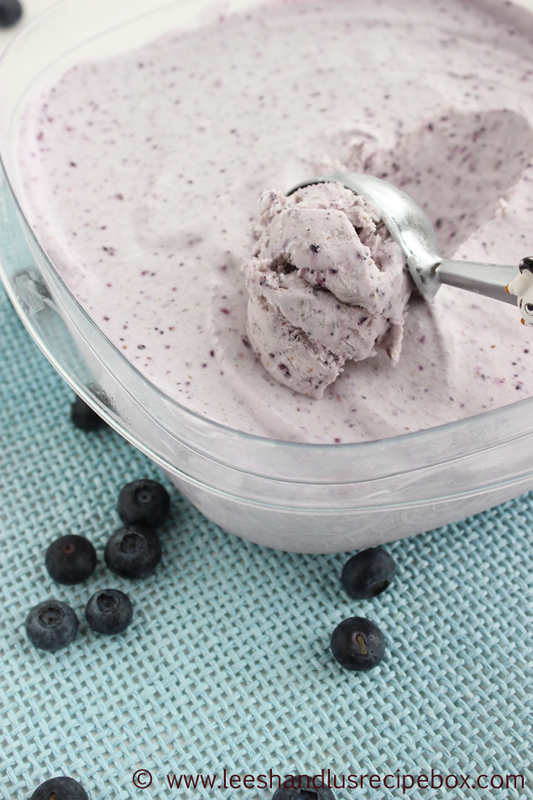 I've seen no-churn ice cream recipes popping up all over the web lately, and decided they must be worth a shot. Have you jumped on that bandwagon yet? I don't have an ice cream maker, but I love homemade ice cream. 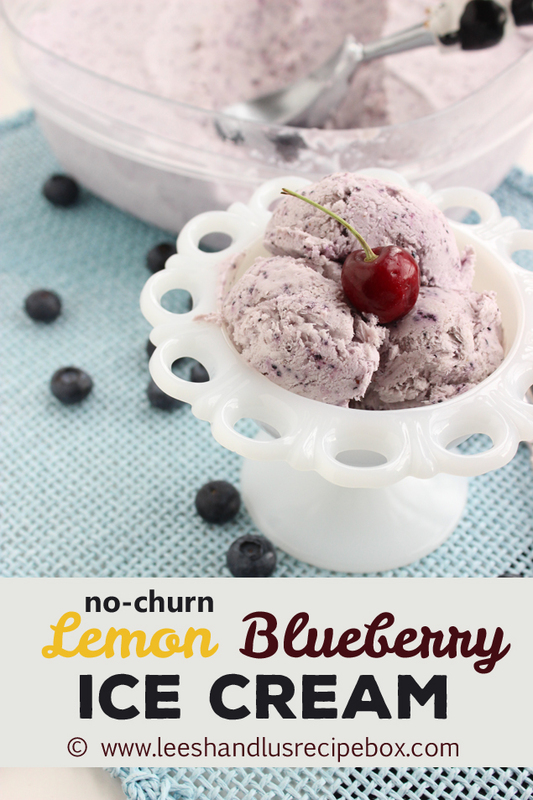 But thanks to no-churn ice cream, I can still enjoy the fresh taste of homemade ice cream made right from my own kitchen. After mulling over hundreds of flavor combinations I went with a favorite flavor combo of mine . Lemon blueberry. 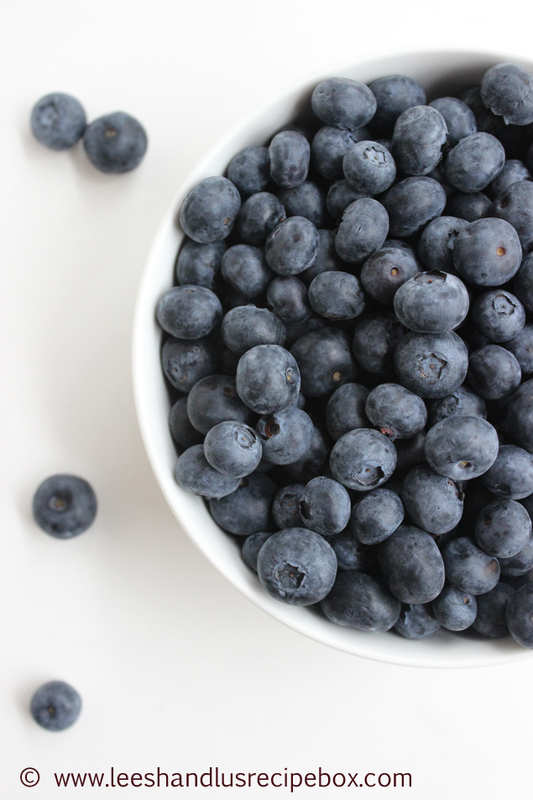 First off, can we stop for a second and admire how beautiful blueberries are! Gah! I'm in love. We've been getting good deals on them fresh at our local grocery stores too, so we've been eating LOTS of blueberries at our house. I love to freeze them and eat them as a treat. They are so good! Have you tried them? Better than frozen grapes in my book. 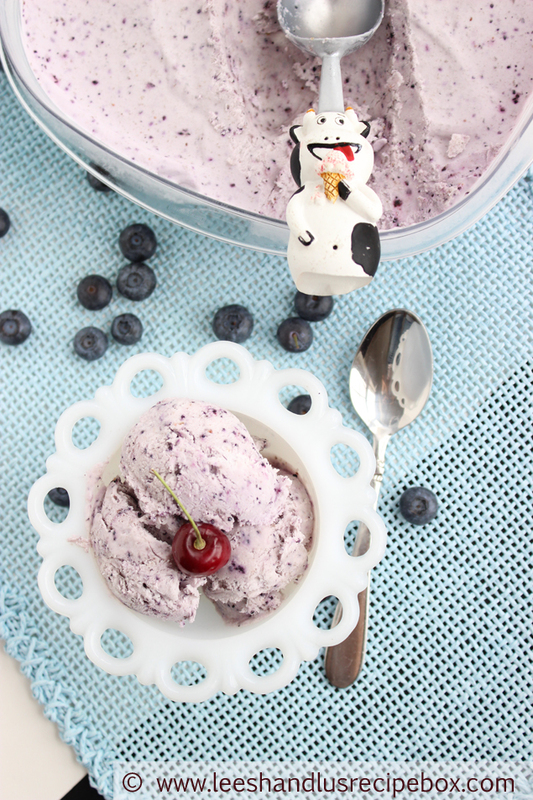 I was really skeptical about how no-churn ice cream would turn out - and while it's a little different than churned ice cream, I still think it's out-of-this-world-good. If you serve it straight out of the freezer it's got a unique texture of frozen and creamy. I also tried smoothing it up in my food processor and it was more like the soft serve ice cream you get from an ice cream maker. Either way, it's deeee-licious! Below are the step for whipping up this yummy concoction! 1. Place blueberries, lemon juice and lemon zest in a 2 cup measuring cup. 2. Using an immersion blender, blend until smooth (isn't that color pretty!). 3. Pour a can of sweetened condensed milk and vanilla in a bowl and mix together. 4. Add the blended blueberry mixture and stir. 5. Stir it until it's totally combined (I love watching the shade of purple change). 6. Whip up two cups of heavy whipping cream with a hand mixer. 7. Fold the whipped cream into the berry mixture. 8. Once it's all combined you are ready to freeze it. 9. Pour it into a large storage container with lid and smooth the top. Place the lid on and freeze for 6-12 hours. Once it is done freezing you can scoop it up into a dish or cone and enjoy. And if you are after a more soft serve consistency, put it in the food processor and process til smooth. 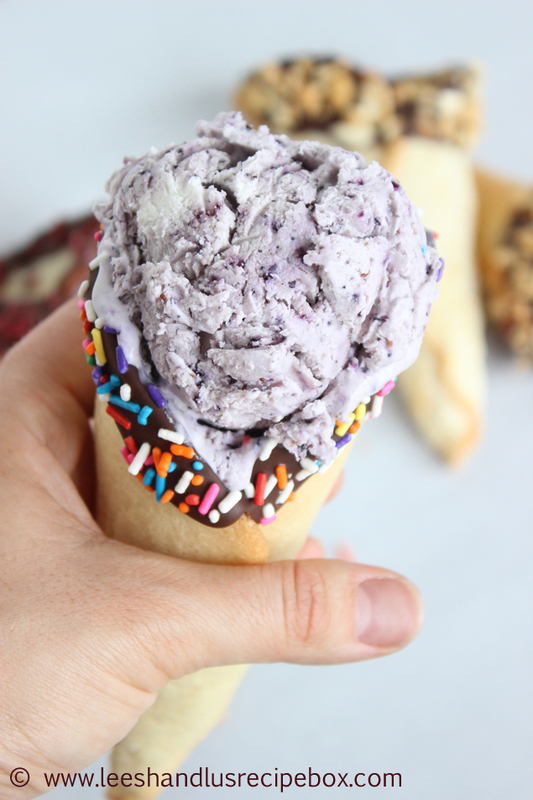 We love making homemade cones too! Here is the smooth version of the ice cream! I hope this ice cream will keep you cool during this hot summer! Enjoy! Place the blueberries, lemon zest, and lemon juice in 2 cup measuring cup and blend with an immersion blender until smooth (or you can use a regular blender too). 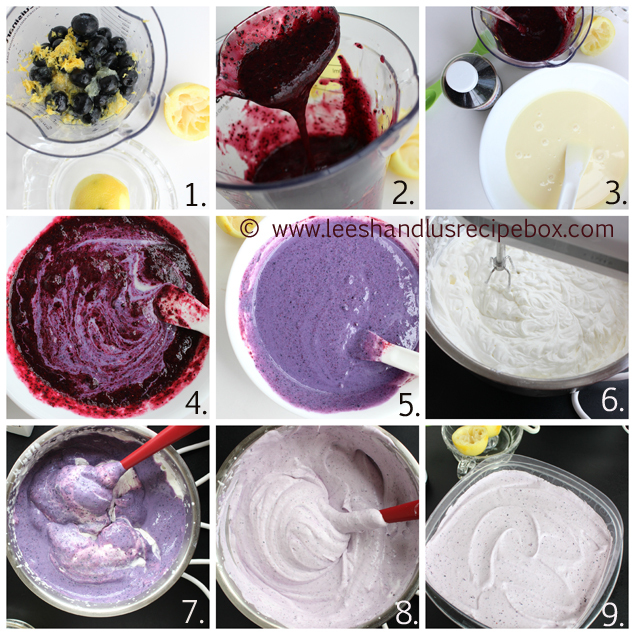 In a medium size mixing bowl, mix the sweetened condensed milk with the vanilla until combined, then add the blueberry mixture and stir until combined. In a medium size stainless steel bowl, whip the 2 cups of whipping cream on medium speed until frothy. Once frothy, increase speed to high and whip until stiff peaks form. Fold the whipped cream into the berry mixture until combined. Pour the mixture into a large storage container with lid (that holds about 1 quart). Place lid on top and freeze 6-12 hours. Scoop and serve in a cone or bowl. 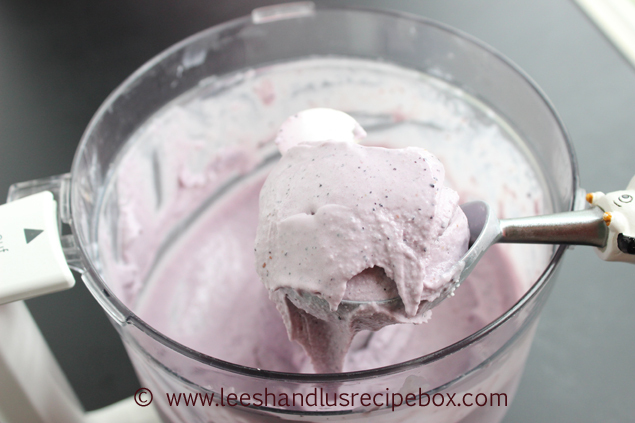 If you want it more like soft serve ice cream place it in the food processor and blend until smooth. Originally posted on Eighteen25.com adapted from How Sweet Eats Blackberry Chip Ice Cream recipe.